One of the great things about CTN is the variety of things that happen over the course of the weekend. There are Live Demonstrations, Networking mixers, Master Workshops, Panel Discussions, Business Seminars, Recruiting/ Portfolio Reviews, and Professional Exhibits as well as One on One personal consultations with industry professionals. The attendees vary from undergrads to professionals and not limited to those interested or already working within the animation community. This was my second time attending CTN. I was there in 2012. One of the first things I noticed was that as I imagined, it has grown. Exhibitors were not only in the main convention area but in an outdoor tent as well. They even had another tent outside to for panel discussions. 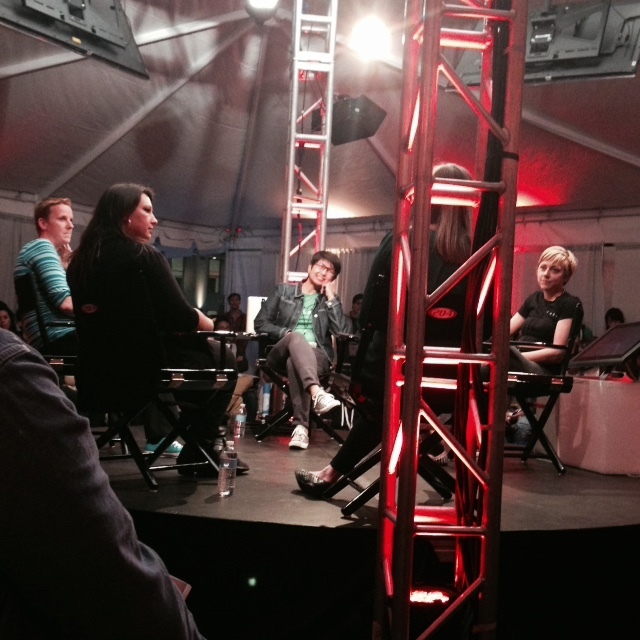 On Friday evening I attended a panel called “The Visionaries: Directors”. It was moderated by Tony Bancroft. The panelists were Rob Minkoft, Will Finn and Shane Acker. For the most part they shared their experiences of being a director and how they ended up directing feature animations. Minkoft shared that he always noticed how apparent a director’s influence was in Warner Bros. cartoons compared to Disney cartoons where the animators were more prominent. Bancroft shared that he got started directing by simply telling people that’s what he wanted to do and was eventually given the opportunity based on expressing that desire. Saturday was a pretty hectic day for me. I attended a motivational seminar “Accomplish your Creative Goals and Projects Now. Don’t Wait for the Perfect Moment” presented by Gary Montalbano. The title says it all. The most valuable thing I walked away with was “trust your unique talents, trust your personal growth.” Then I attended a panel called “The Women of Pixar: Animation and Story” where Valeria LaPointe, Gini Santos, Becki Tower and Kristen Lester each shared their trials and tribulations of being in predominately male spaces. The panel was moderated by Angelique Reisch. I really enjoyed this panel, the ladies were hysterically funny. I do wish that it was “Women in Animation” and women who worked at other companies such as Dreamworks, Blue Sky and Sony Pictures Animation were on the panel as well. I feel that hearing experiences and similarities from women who worked at different companies would have been worth hearing. Then I attended “A Conversation with Legendary Animator Andreas Deja” That was simply amazing! Hearing seeing him and hearing his journey in person and not reading it from books, posts and podcasts was a great experience. To close the night I and many others saw Song of the Sea. Director Tomm Moore was there to introduce the film and stayed afterwards for a Q&A. I stood up for the whole thing and it was worth it! Seeing it a second time I got to catch things I didn’t or couldn’t the first time I watched it. On Sunday, the last day of the convention I attended “A Process of Planning for Animation” which was a Master Workshop by Jason Ryan. This was great too because I have been following him for the last two years and I am currently reacquainting myself animation using his tutorials. Seeing him demonstrate his process, sharing advice and answering questions was much appreciated. The last event for me was probably the most helpful to my career, it was “Walt Disney Animation studios – Production Management: Making it Happen!” The Panelists were Heather Blodget, Nathan Curtis, Mike Haung and Leah Latham. This panel meant a lot to me because I have made the decision since having interned with NYICFF for almost year to switch my career track to Production Management. It was extremely reassuring for me to hear testimonies such as Leah’s that was so similar to me. She went to school for animation, changed majors to storyboarding, graduated and realized her talents for more managerial things and pursued that. Like I said in the beginning of this post there were so many artists, studios, software companies and publishing companies at the expo. I collected so many business cards and bought my share of artwork and pins. Besides being an attendee I was also helping out at The Book of Mojo table with the Director and creator Everett Downing. I also got a chance to meet the creators of the Dam Keeper. It took me all weekend to get their picture since they had about 2 presentations and were doing portfolio reviews at their table. Robert Kondo & Dice Dice Tsutusmi - Creators of "The Dam Keeper"
As expected I had a great time at CTNx. I met so many people, learned a lot, received great advice and more! Granted there are things the event can improve on overall. One thing I particularly would like to see is more of the artists, panelists, speakers, moderators reflecting the diversity of the attendees. It was beautiful seeing the variety of people that came out to the event and I’m sure many of us would like to look on those stages and see people that looked like us up there. We know they exist. Thanks for the memories CTNx! !